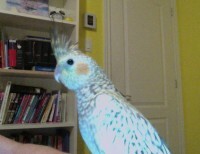 LOST: Canada, ON, Cornwall, Pearl Cockatiel ‘Cricket’, Sept. 16. 12. Cricket is very affectionate, but will nip at you if you’re not loving on her terms! She can wolf whistle and is very vocal, if you whistle near her she will most likely whistle back. Her flight feathers are fully grown in, but she is very tame and trusting.